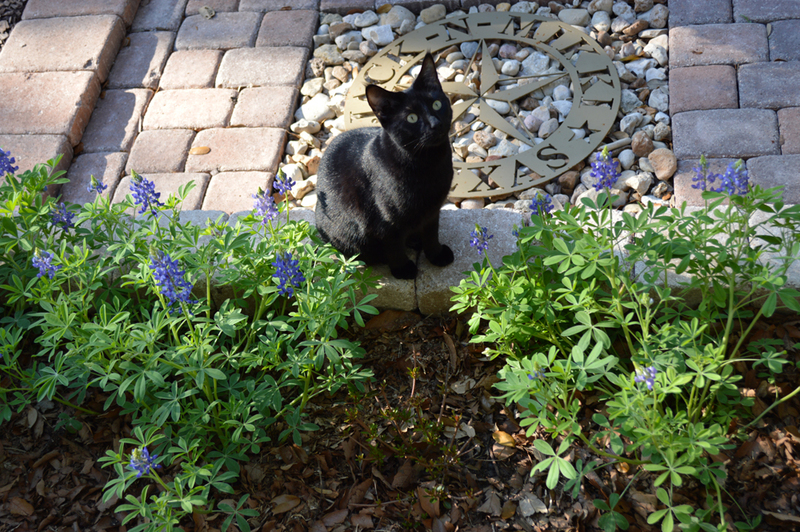 I’ve chosen to plant Dioxazine Purple Salvia and Cobalt Blue Plumbago in the distant courtyard. Since these are cool colors they recede and will fall in back of the brighter, warmer flowers that are going to be planted in the foreground. 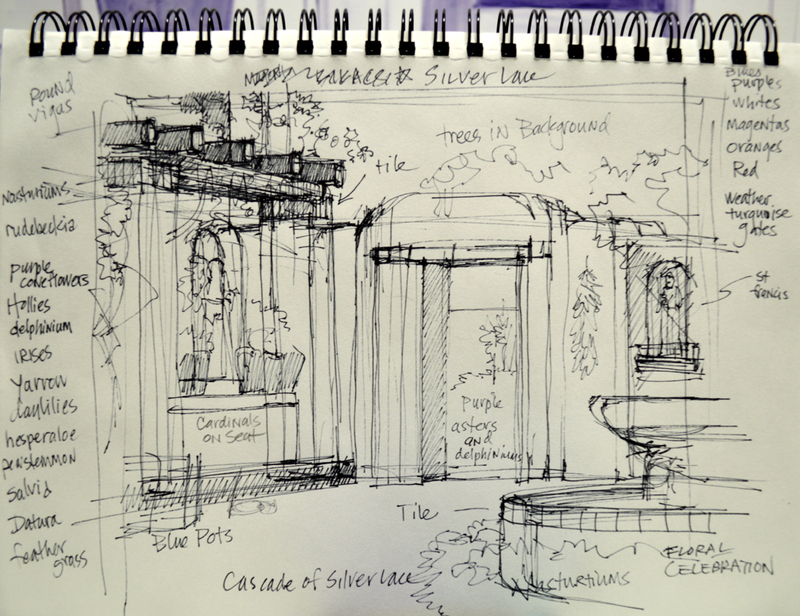 Let’s go back a few days…..I forgot to mention a change I made when sketching my basic plan up on canvas. 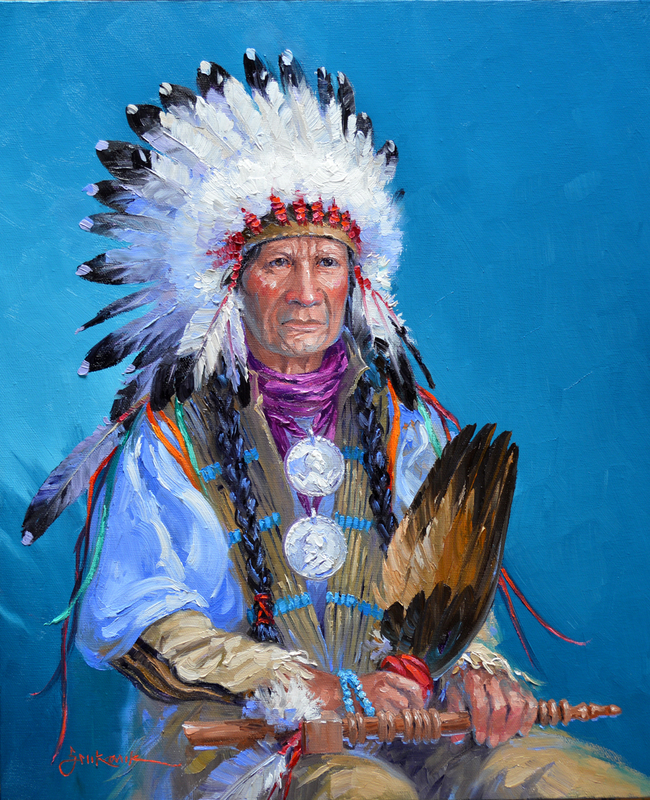 A few of my “Eagle Eye” readers noticed and asked, “why did I change the direction of the steps in the background?” After putting them in initially I didn’t like the feel, the steps as I first drew them took the viewer out of the painting. By turning them the other way, the path through the painting makes a gentle “S-curve”, leading you back into the painting and overall much more pleasing. The tile floor is now blocked in, establishing the shadow and light pattern. 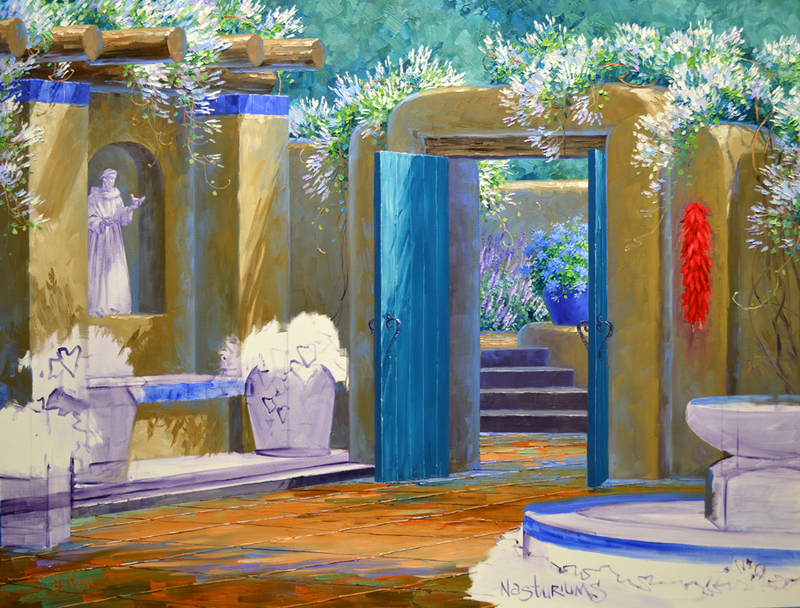 Strokes of blue and purple left over from the Salvia and Plumbago are added along the back edge of the shadows. This makes them “Lay Down” and recede. The crevices between the tiles are drawn into the wet paint of the floor with a fine liner brush. 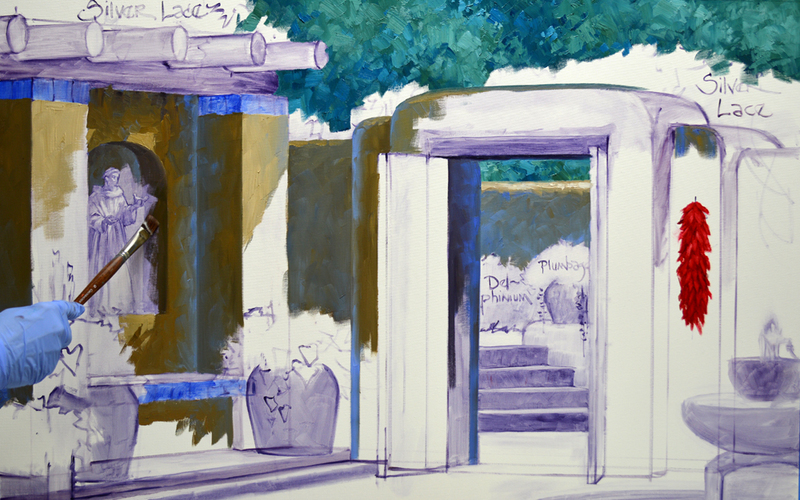 The perspective lines also help to give the painting more depth. The background is blocked in first. 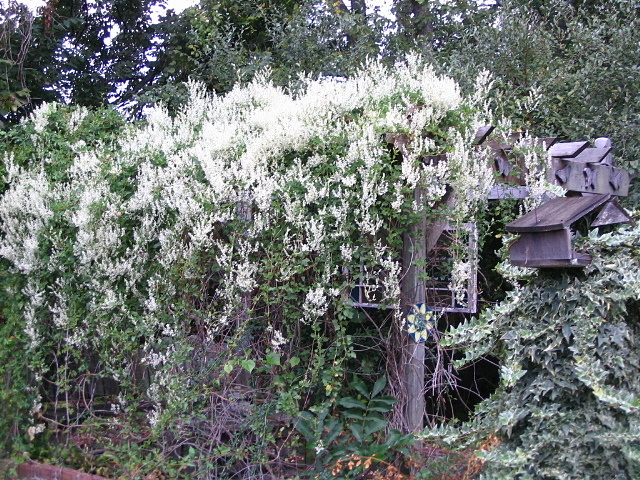 The dark trees will accentuate the White blossoms on the Silver Lace Vine. 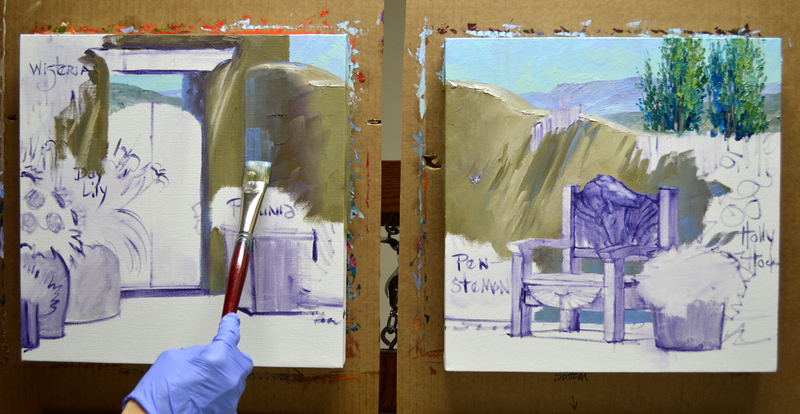 Mixes of Pthalo Blue + Cadmium Orange + White are used. More Pthalo Blue is used so the greens will be cool, making them drop back. 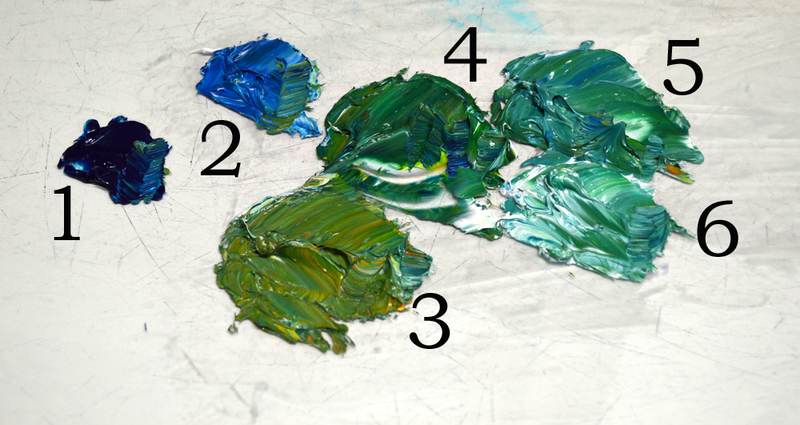 Increasing the proportions of Cadmium Orange would make the green mixtures warmer. The building is painted next. 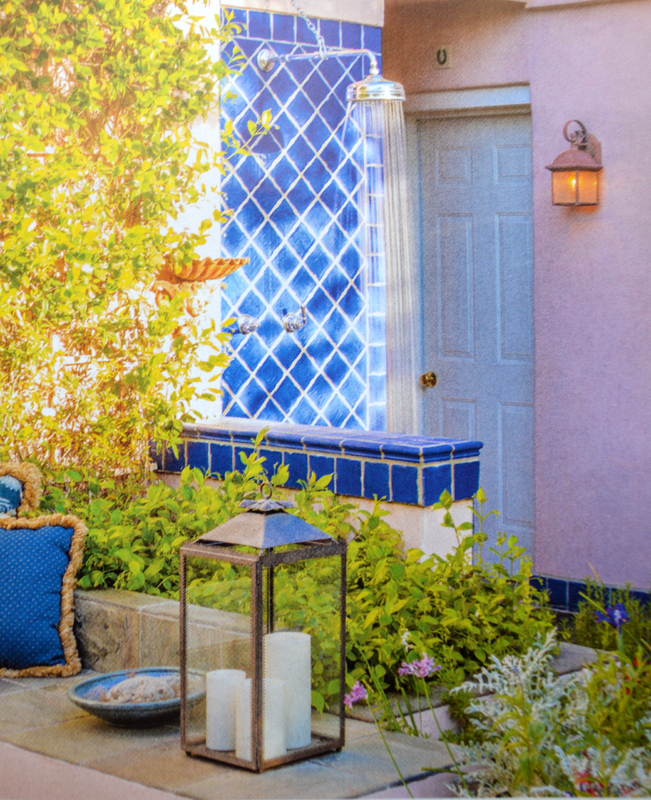 Notice how the distant wall of the courtyard is made bluer. This follows the simple rule that helps to give the impression of depth in a painting: Cool Colors Go Back, Warm Colors Come Forward. So the mixtures for the adobe building in the foreground are made warmer. The walls are complete, had to get them finished before I can let the Silver Lace Vine grow over them. OK, let’s do some planting! 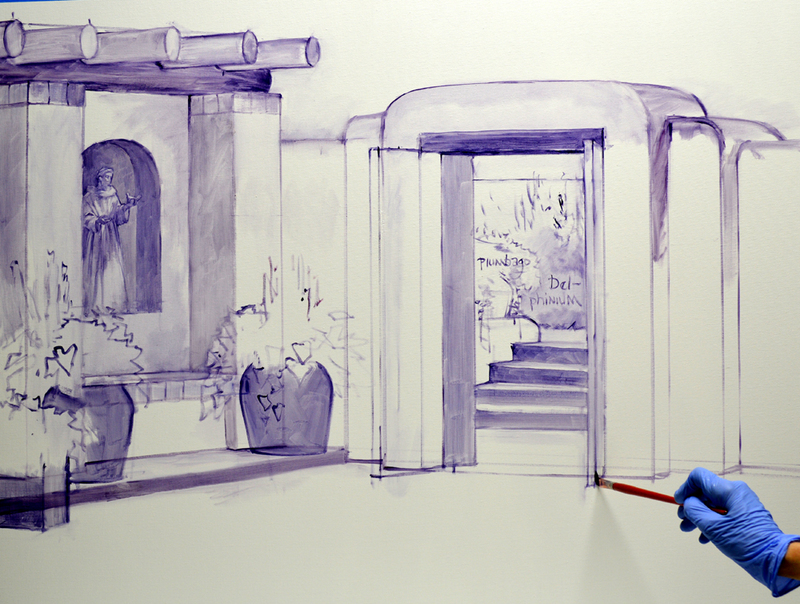 The process of painting the delicate vine is shown in this VIDEO. This piece is going to be my showstopper for our Santa Fe Collector Event. The outside dimension is 36 inches tall by 48 inches wide. 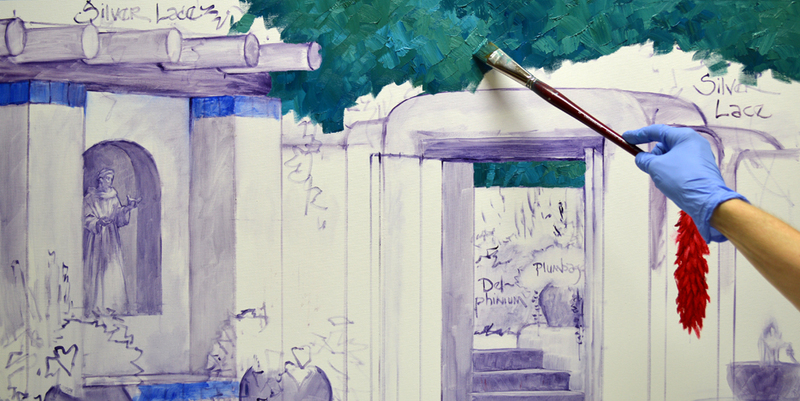 I begin by drawing up the architectural elements of the painting. 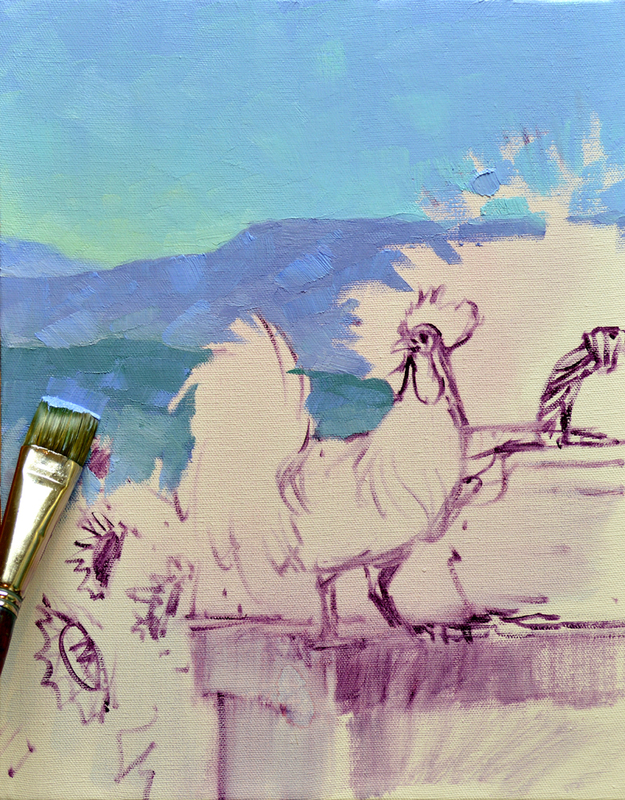 A brush dipped in a thin wash of MUD (Ultramarine Blue + Alizarin Crimson) + Liquin is used. Even though a lot of the building is going to eventually be covered by plants I have to make certain the perspective is correct. A lot of my reference material is saved as digital images, I just put the laptop on my palette and my models for the St. Francis sculpture are handy. These shots were taken at Mission San Diego in California. To see them better you can enlarge the picture by clicking on the image. Our courtyard is beginning to come together. Notice how I’ve left the areas where the plants will be white or almost white. The flowers and leaves will be more luminescent when painted over the blank canvas. 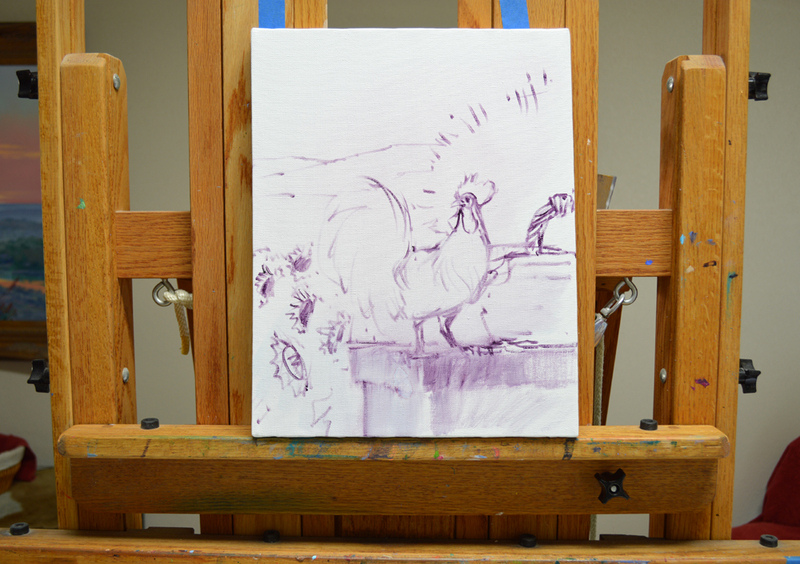 We’re all sketched up and ready to begin applying opaque oil paint in the next session. Hope you’ll come watch! It’s full heat blast here in Texas, we’ve been hitting 102 and 103 degrees daily. Hard to think of fall but cooler weather is just around the corner. 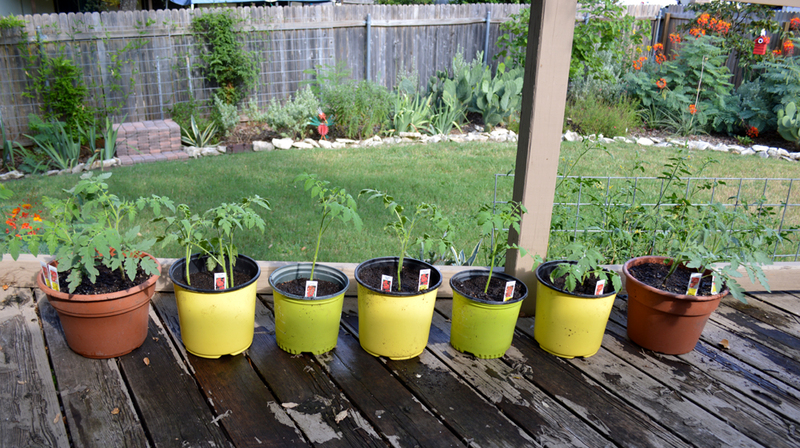 So I’ve potted up our fall tomatoes, that way we’ll be able to enjoy them for Thanksgiving. They’ll go in the ground when the weather breaks but right now they are getting a head start on developing their roots. I’d like to thank Jennifer H. for this quote. We’ve all heard different variations of “PAY IT FORWARD”. Jack and I feel the only way we can repay those who’ve helped us along to way is to help others. That’s the main reason for this blog. I’ve been extremely blessed as an artist and want to pass on any knowledge I can to others. Many of you have asked where my ideas come from. The answer is simple, EVERYWHERE! We are constantly taking pictures and see paintings in every direction we look. 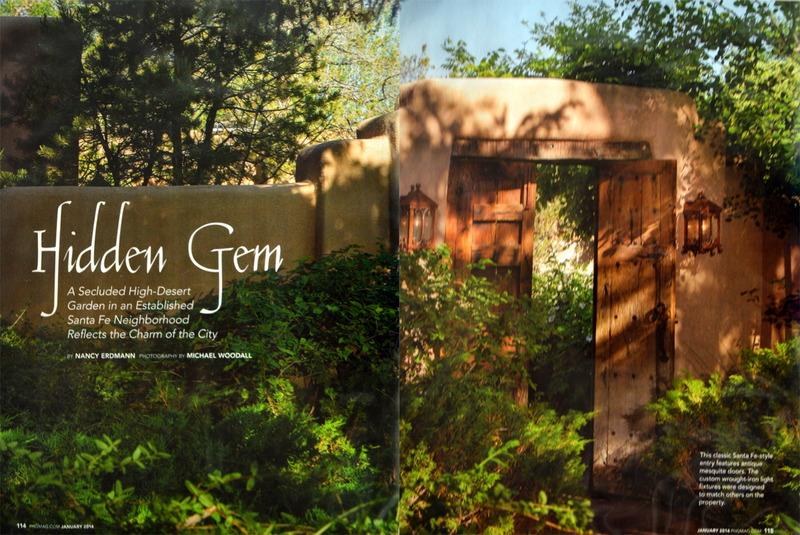 I found this spread in one of my favorite magazines, Phoenix Home and Gardens. 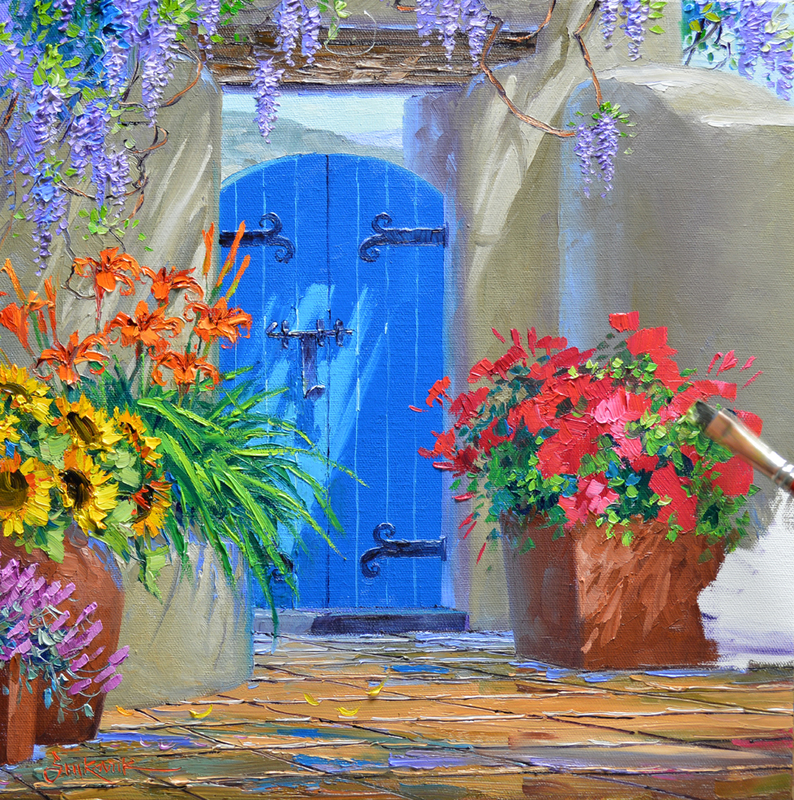 I love the old gate and adobe wall so I’m incorporating it into one of the pieces for my Annual Collector Event in Santa Fe. I also was attracted to the niche and wrought iron door handle in the photo above. So those will also be thrown into the idea mill for this painting. 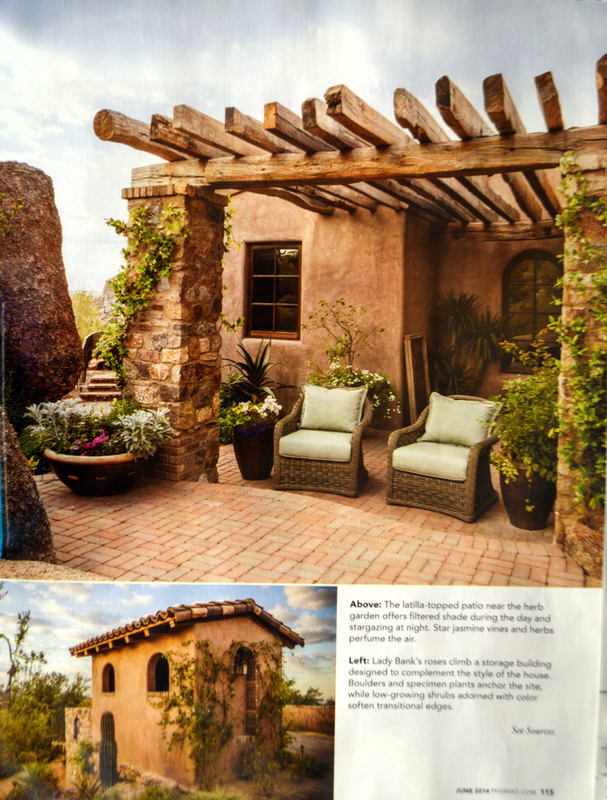 Isn’t the pergola in the top photo pretty cool? Some how I want to work that in……. And I absolutely have to add some of these great Blue Ceramic Tiles. I love Silver Lace Vine. It’s going to be my main star draping over the adobe wall and weathered turquoise wood gate. Here is my “thinking” sketch. 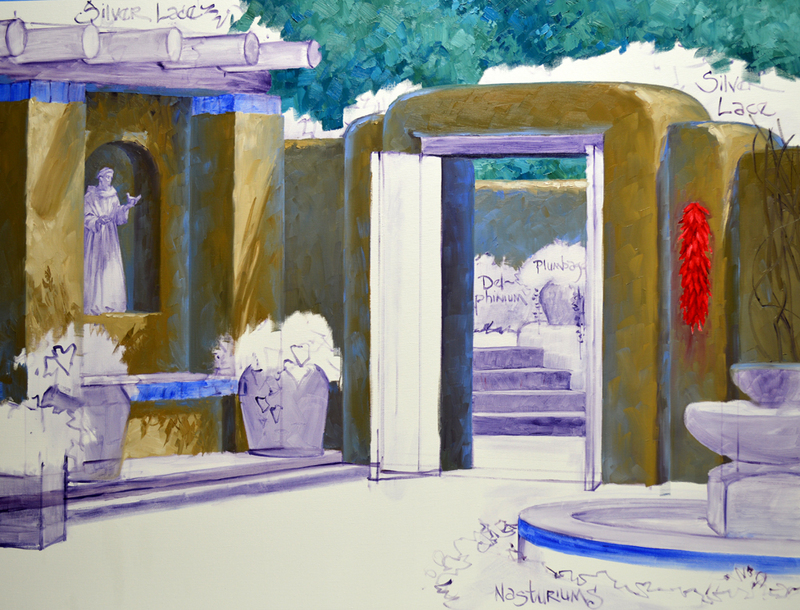 I originally had the niche on the right side, then realized the water in the fountain needs a darker backdrop. So I moved the niche and St. Francis to the left side under a pergola with tile topped columns. Then I decided to carry the tile theme to the fountain, lining the top edge of the base. 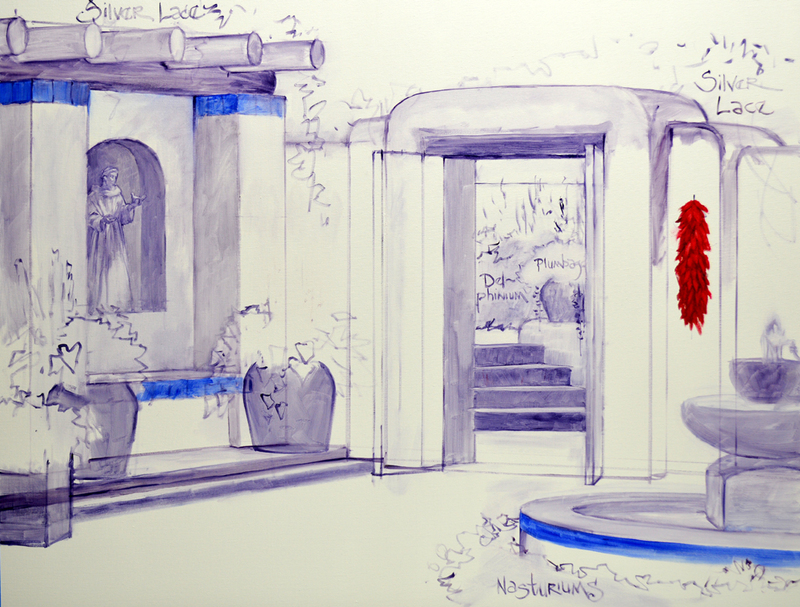 The lists on both sides of the sketch are flowers found in Santa Fe. Since the sketch is not going to be shown to a client for a commission I leave it at this stage. I have enough information to give me a “map” to follow as I paint. If you’d like to enlarge the drawing just click on the image. I have a couple of VIDEOS for you today! 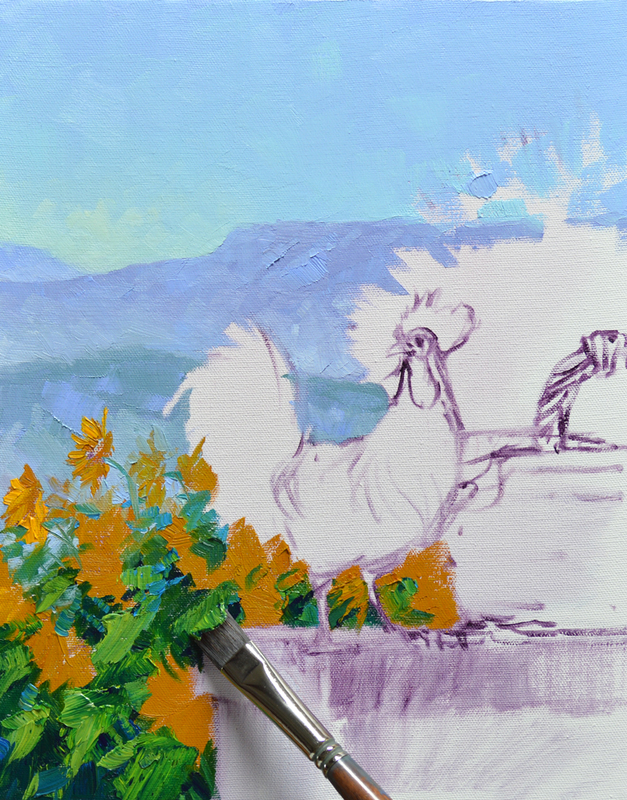 I’m showing the process of painting the Rooster in two parts. 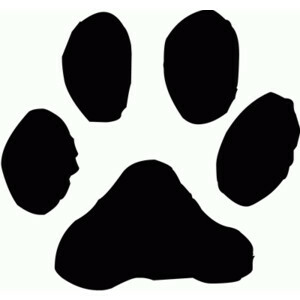 The first is the general block in of the body and tail. Then details in these areas are defined. Now, let’s concentrate on the head, eye and comb. Please keep in mind, after you start the video you can enlarge it by clicking on the little screen icon on the right side of the black band across the bottom. 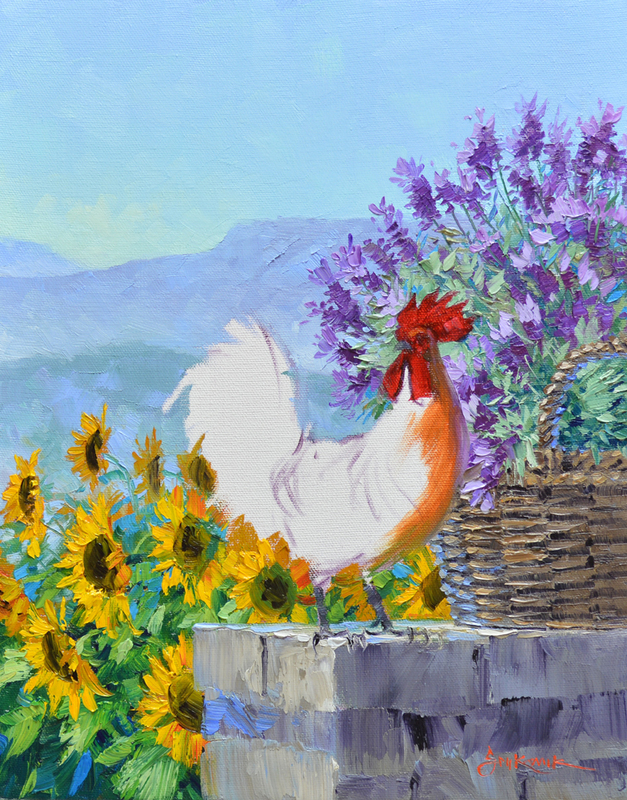 Another fun commission to do, a happy little Rooster nestled by a basket of Lavender as he surveys a field of Sunflowers. 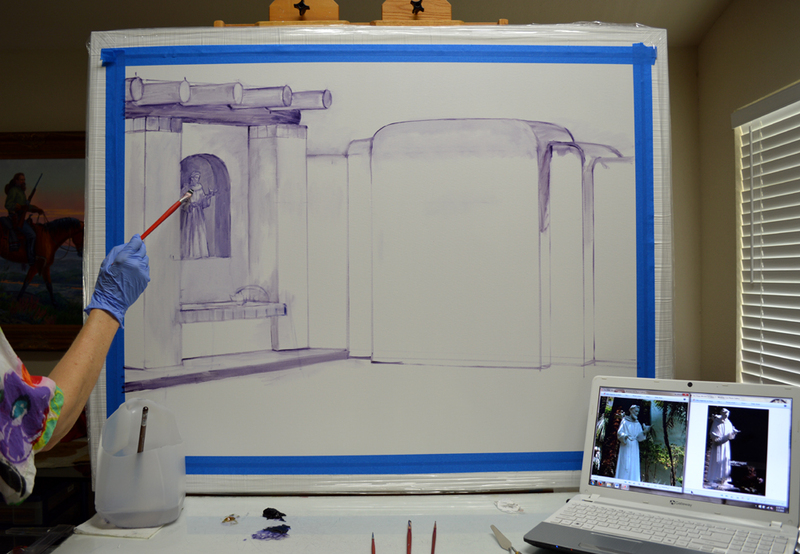 The basic elements are sketched up on the canvas and we’re ready to begin applying paint. Following my usual method I “Paint Forward” beginning with the sky. Then the most distant layer of mountains is made bluer so it will recede. The middle layer is made more purple while the closest is painted with mixes of Pthalo Blue + Cadmium Orange + MUD (Ultramarine Blue + Alizarin Crimson) + White. If you would like to learn more about our Double Primary Color Mixing System CLICK HERE. The mountains immediately drop farther back when the warmth of the field of Sunflowers is added. The sunny blossoms were blocked in first, followed by the large, green leaves. 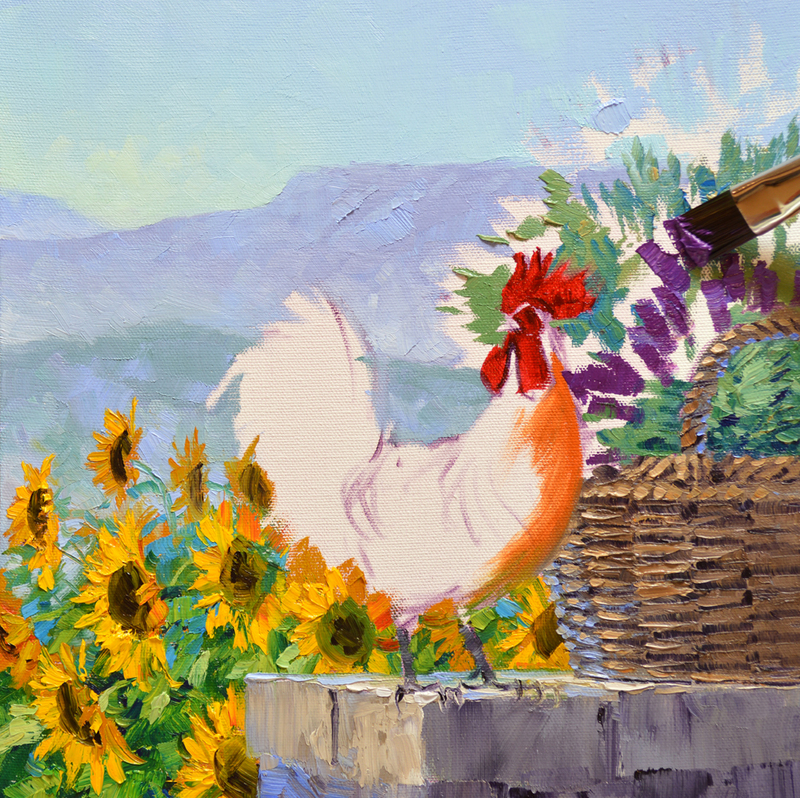 The foliage color is worked around the flowers, helping to define their shapes. Please remember, you can click on any of the images to see them larger. 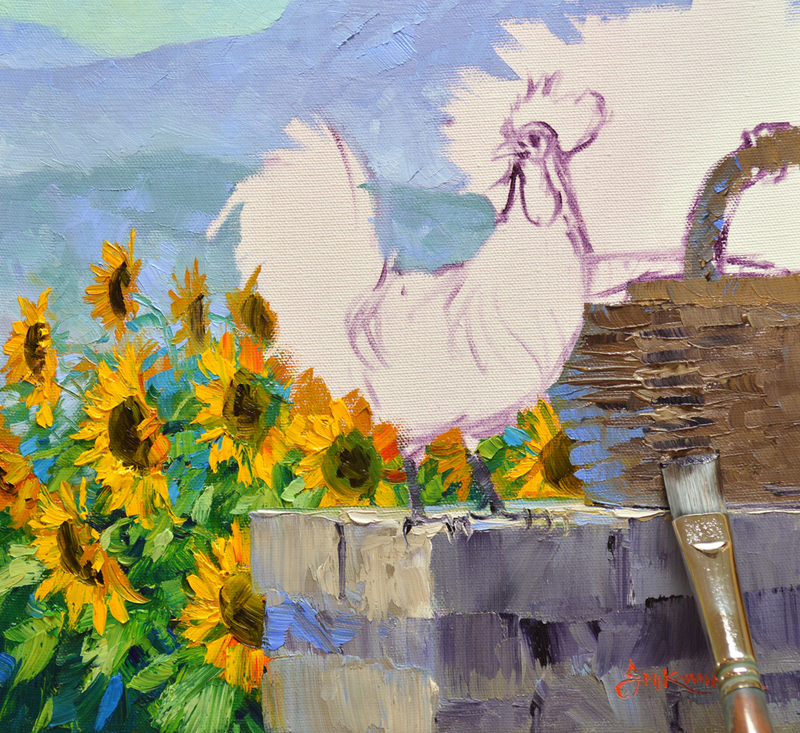 The old basket is made of mixes of Ultramarine Blue + Cadmium Orange + White. The flat edge of a medium Bright brush is used to delineate the pattern of the woven wicker with a dark mixture of these same colors + MUD. Notice how the left side of the basket is made bluer, this helps to give it the appearance of roundness. 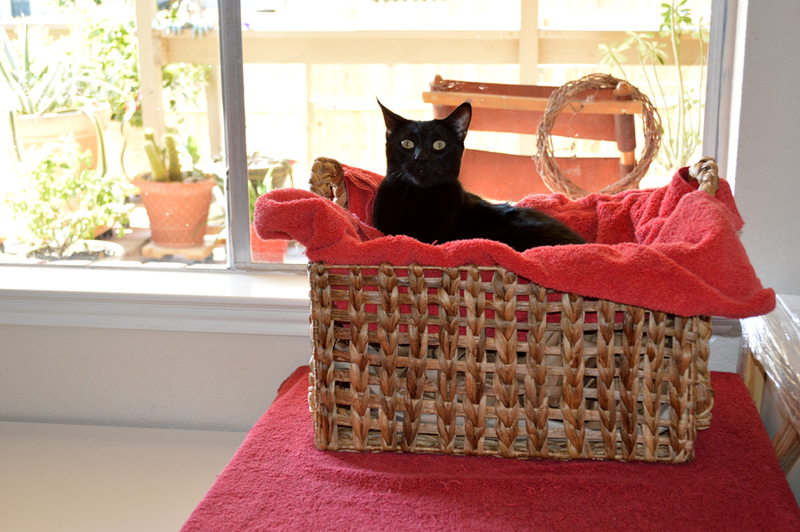 Now we’ll work on the Lavender in the basket. Opposite of my usual sequence of Flowers First, Leaves Last I start with the gray-green foliage. Then I add the flowers in various mixes of Magenta + Dioxazine Purple + White. The thick paint is gently “Laid” over the greens. I don’t want to pick up the underlying color, it will muddy the blossoms. If I do get any of the green on my brush I just wipe it off with toilet tissue. 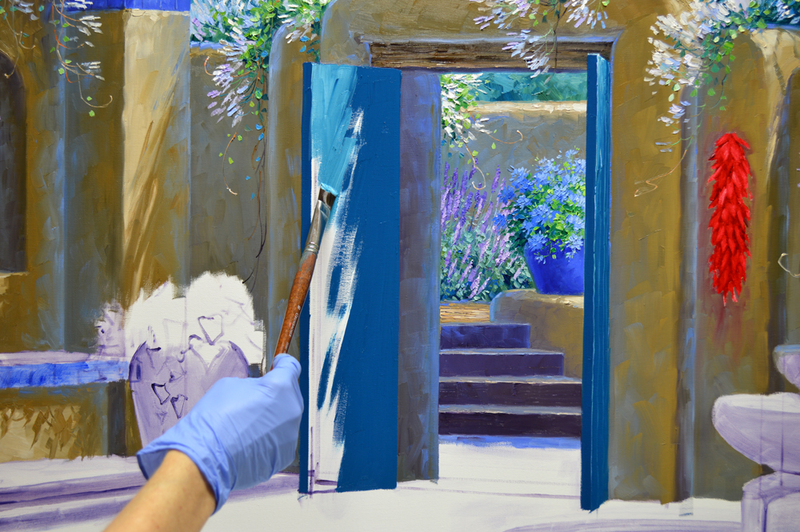 A clean brush gives you clean color on your canvas. This Blog is a milestone, NUMBER 1,000. Can you believe it? WHEW!!!!!!! I really appreciate you following along. Today I’m concentrating on the little bench under the Wisteria. This post gives you an example of how I combine ideas. 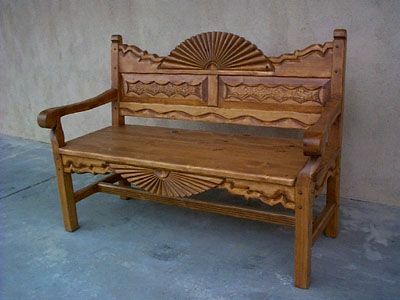 I went on Google.com and searched Southwest benches. 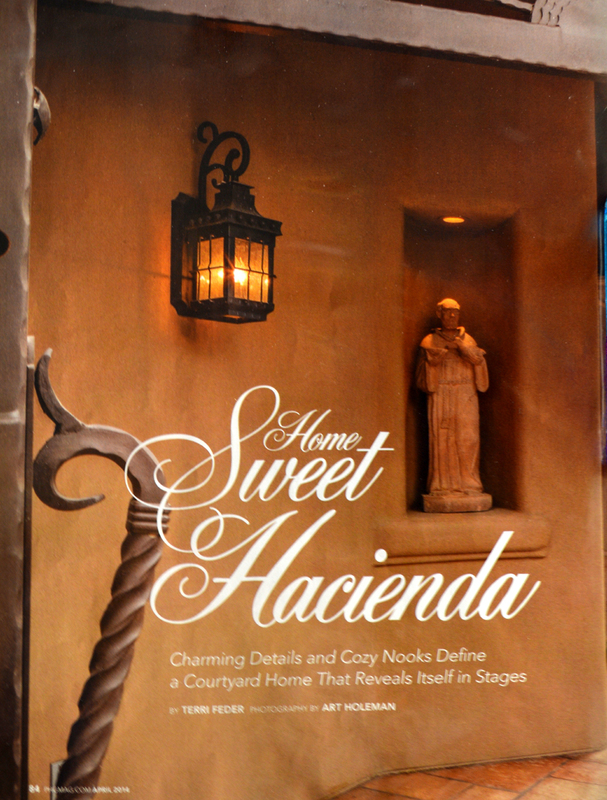 These are two of the ones found, this piece is a nice example of the furniture you see in Santa Fe. 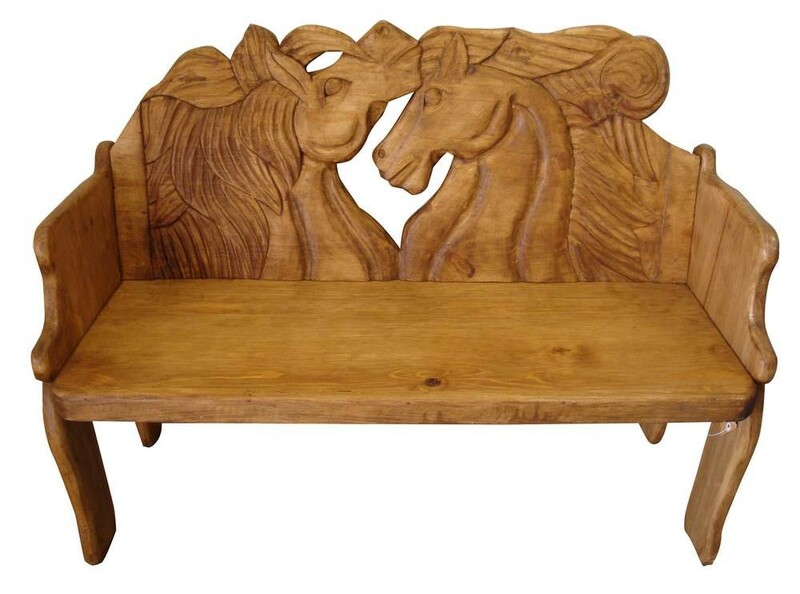 My heart jumped when I saw this horse head bench. If you’ve followed by blog very long you know I’m Horse Crazy! So I combined elements of each and designed my own Southwestern style settee. TWO VIDEOS TODAY! Blocking in the bench. VIDEO: Putting in the final details. You can enlarge the videos to view them better. After starting the VIDEO just click on the full screen icon on the far right side of the black bar along the bottom. Now we’ll plant a stand of White Hollyhocks next to our wooden ponies. The diptych is complete. I planned the pieces to hang as a pair or individually. Please remember as you read through my blogs, you can click on any of the images to see them larger. Look for the hummingbird in Serene Embrace! 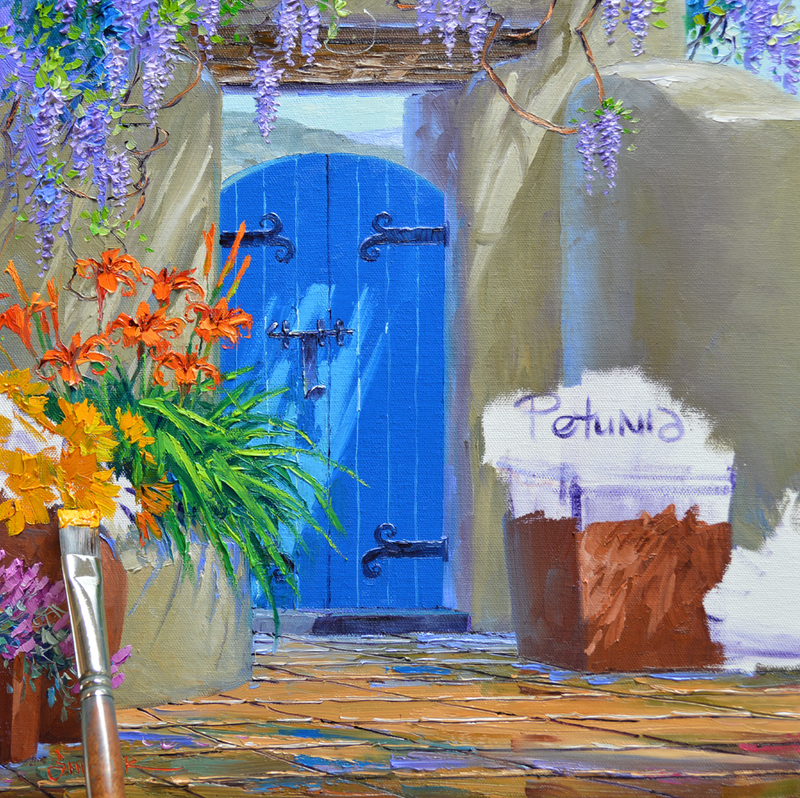 Hope you’ll come see us at the Santa Fe Art Collector Gallery at our Annual Event September 4th and 5th! You can see the paintings in person then……hope they have a couple of red dots by them! The paint for the Day Lilies is all mixed. #1. Cadmium Orange + Cadmium Yellow Medium. #2. Pure Cadmium Orange. #3. Cadmium Orange + Alizarin Crimson. #4. Four different shades of Pthalo Blue + Lemon Yellow. #5. Pthalo Blue + Liquin. VIDEO TODAY! 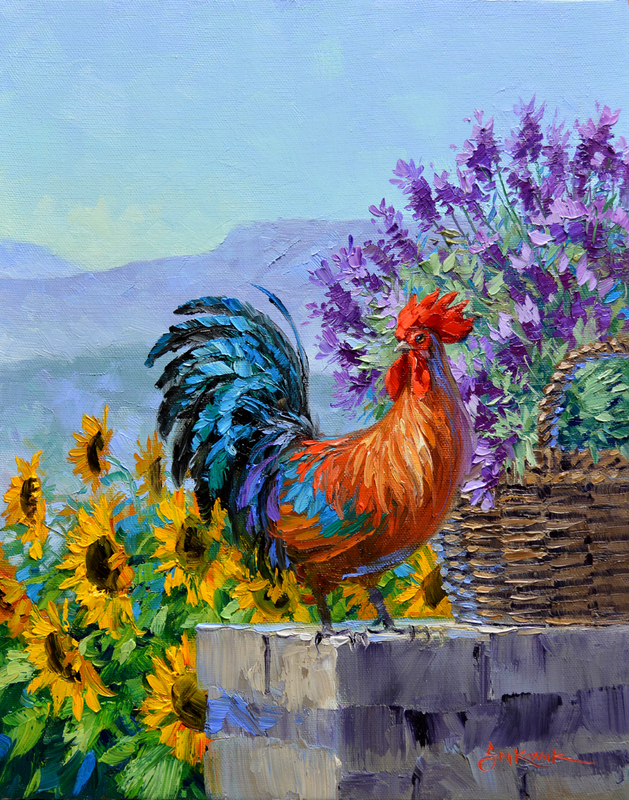 I paint the Day Lilies opposite my usual sequence of Flowers First, Leaves Last. 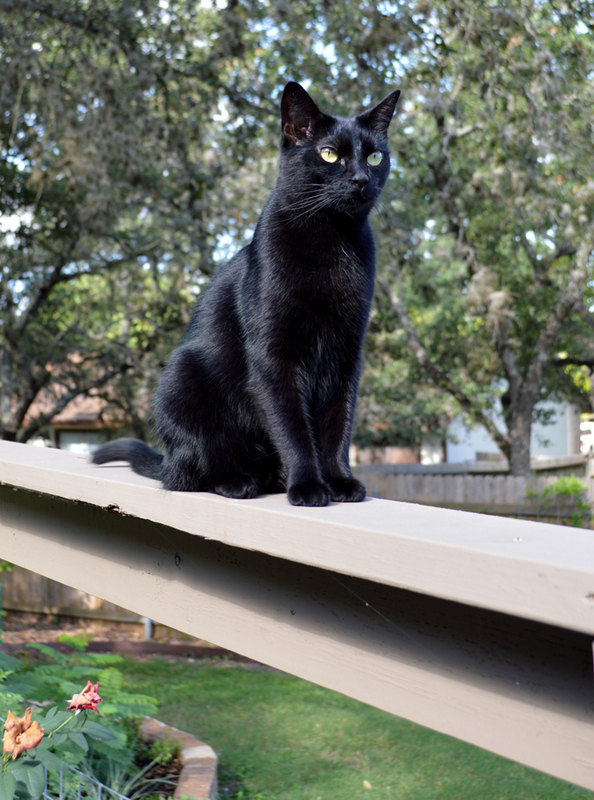 Since the bright blossoms hover above the long straplike leaves I block in the foliage first. Then the thick paint of the flowers is gently “Laid” on top of the underlying color. 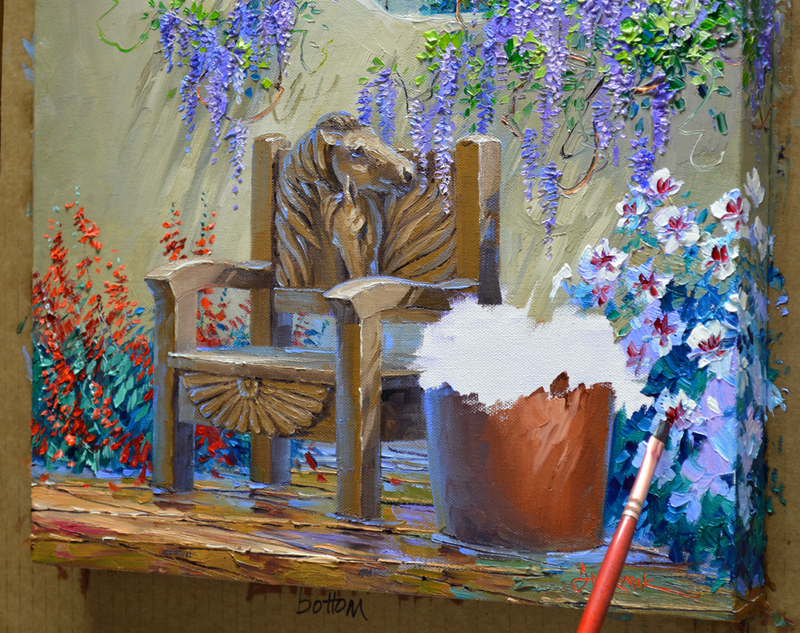 I don’t want to pick up any of the wall or leaf paint on my brush, it will muddy the intense hue of the blooms. The Sunflowers are now blocked in going back to my normal process. The leaves will be painted around the yellow, helping to shape the large blooms. Petunias, made of various mixes of Permanent Rose + Cadmium Red Light + White, fill the large square container by the gate. 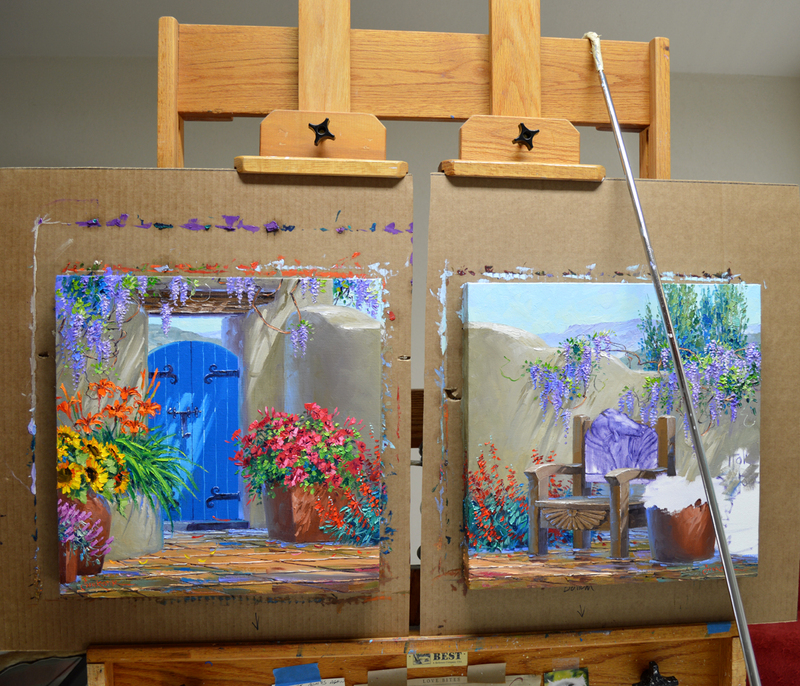 Red Penstemon jumps from the canvas on the left to the one on the right. We’ll paint the unique little bench in our next session. There will be videos! Hope you’ll come follow along. Jack’s newest article is out on FineArtStudioOnline. Wasn’t that a fun article? Jack is such a great storyteller. Now….back to painting. The blooms of the Wisteria cascading over the courtyard wall are made of Dioxazine Purple + White. The tile floor is painted with the light and dark pattern, then the perspective lines are drawn into the wet paint with a fine liner brush. The challenge is drawing the perspective lines on the floor over on to the sides of the gallery wrapped canvas. It’s much easier to do this with the canvas flat. Since the canvas is mounted to cardboard I can handle the wet painting with ease. Molly, our studio supervisor, makes certain I get it all correct. The floors are done and we’re finished for today. One of our readers asked a great question that I’d like to share with all of you. 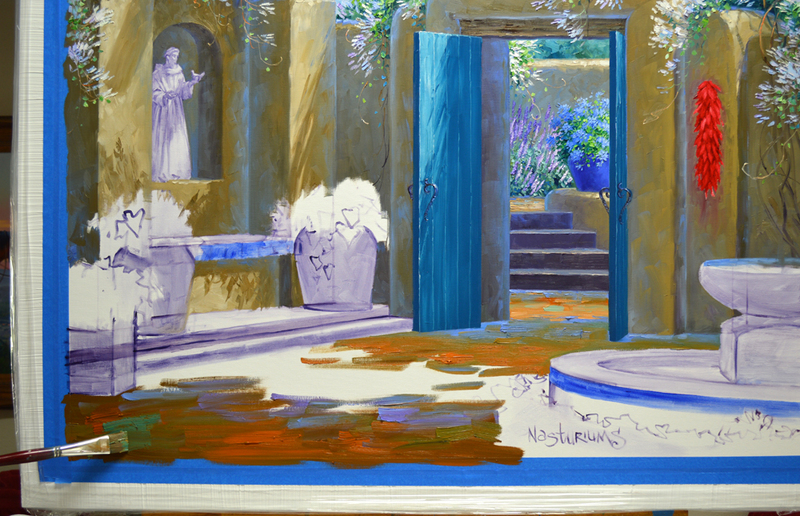 I noticed in this painting, Secluded Elegance, (you can click on the link to go to that blog) that you added cool highlights on the tile floor quite near the front of the painting and it totally seems to work and look wonderful. I wouldn’t have tried that thinking it would push something too far back or been too challenging to make what was behind it look like it was in its proper place. If you have a moment sometime to help me understand your thought process on this, I would be very appreciative. Here is my response: The cool highlights nearer the front are actually the back edge of the foreground shadow. 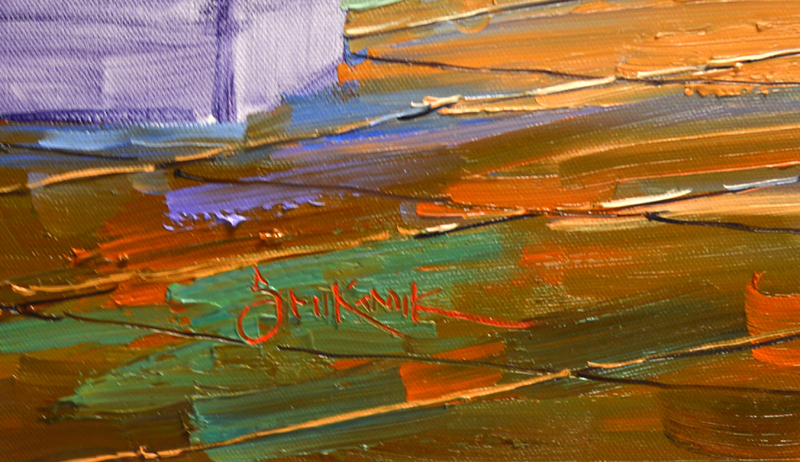 By adding some cool brushstrokes there it makes that edge recede. Also I’ve made a few cool green strokes in the area where my signature is. The green intensifies the red signature. The background is done first. After painting the sky and distant mountains I’ll concentrate on the Poplar Trees. 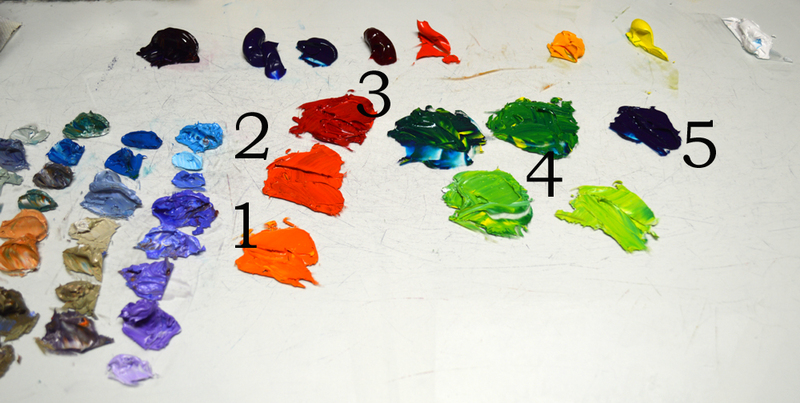 My color mixtures are shown above. #1. Pthalo Blue + Liquin. #2. Pthalo Blue + White. #3. Pthalo Blue + Cadmium Yellow Medium + White. #4. Mixture #3 + more Pthalo Blue. #5. Mix #4 with additional White. #6. Even more White added to mix #5. “Painting Forward” the adobe walls of the courtyard are now constructed. 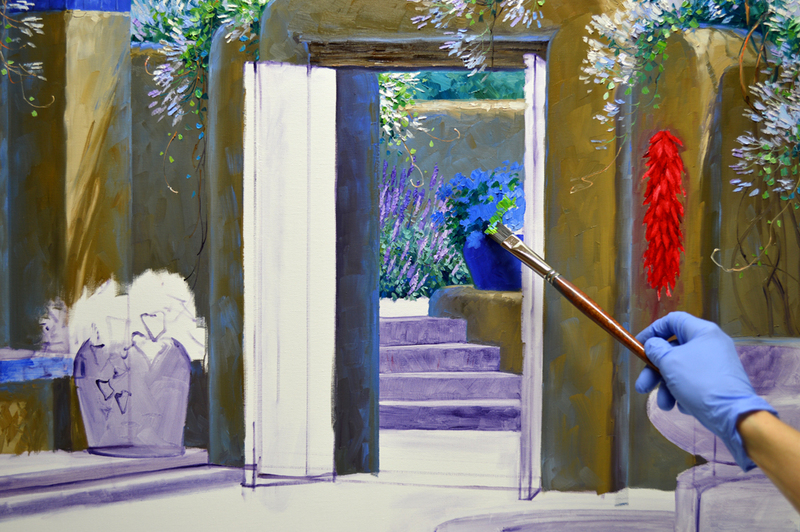 I use various mixes of Cadmium Orange + Ultramarine Blue + MUD (Ultramarine Blue + Alizarin Crimson) + White. 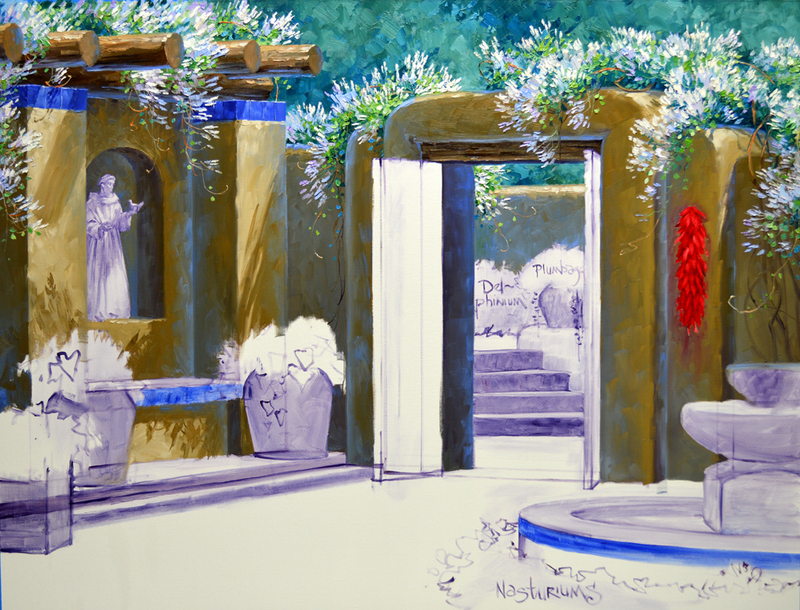 As the back of the lower wall curving around to intersect with the gate I add some Ultramarine Blue + White. Cooling the most distant edge where the two walls intersect makes it recede. 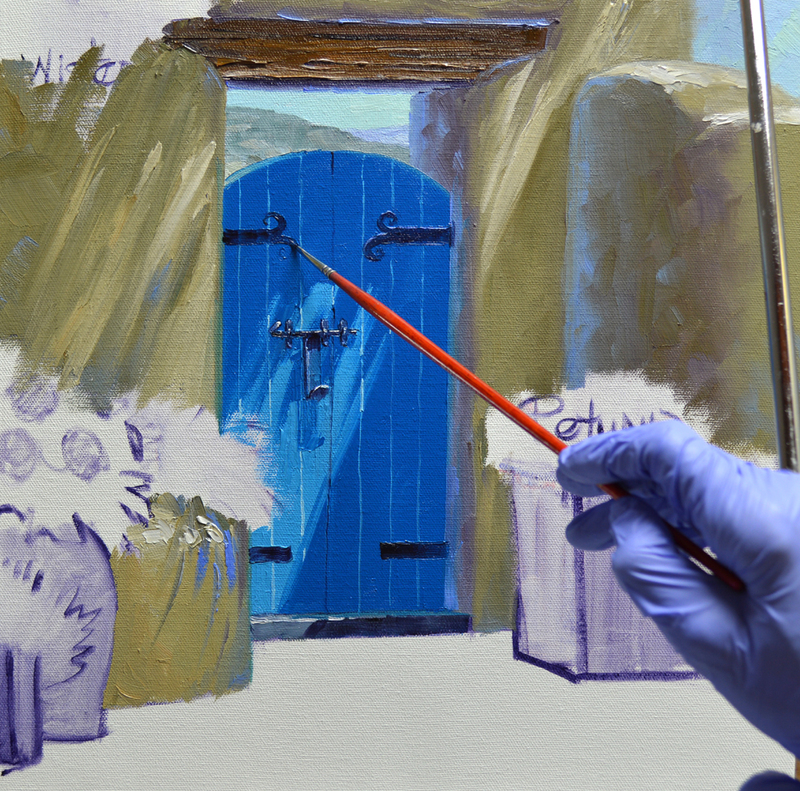 Light and dark shades of Pthalo Blue + White are used for the arched gate. The latch and hinges are drawn into the wet paint of the gate with MUD + Liquin. The mahl stick is used to steady my hand as I delineate the details of the hardware. Our structure is complete. We’ll start doing a little planting and laying tile in our next session. Hope you’ll grab your work gloves and come help! Don’t Forget…….My eBay auction for Chief Red Fish ends Tomorrow, Wednesday at 8 PM Central Time.